We all hope that our very own babies won’t get sick. But when a newborn baby is diagnosed with a life-threatening condition, no matter how early or late in pregnancy, it is already a loss that parents grieve. For Aries and Chillet Cabildo, there’s nothing more heartbreaking than discovering that their only child, Asher Carlos, has a problematic heart. They discovered Asher’s illness a week after he was born when they brought him to a well-baby check-up. The doctor heard a murmur in his heart so they were immediately referred to a pediatrician-cardiologist, who diagnosed Asher suffering from Tetralogy of Fallot. While the doctor recommended Asher for surgery, the doctor advised them to wait until he turns one-year-old. So Chillet worries whenever Asher would experience shortness of breath while playing, and when he cries, his lips and face would turn bluish. Chillet suspected that Asher got his illness from his late father, who died at the age of 58 from heart enlargement and a congenital coronary heart disease. While they discovered his father’s illness five years before he died, he took his illness lightly by refusing to take regular medications because of financial difficulties and it was already too late for him to undergo a triple heart bypass surgery. Chillet, 25, finished Chemistry in college and used to work as a clinic assistant. She had to give up work because of her delicate pregnancy and to take care of Asher full time. Aries, 29, works as a collector in a lending company and earns a minimum of P7,000 a month, so they really have no means to sustain Asher’s monthly medications and surgery. 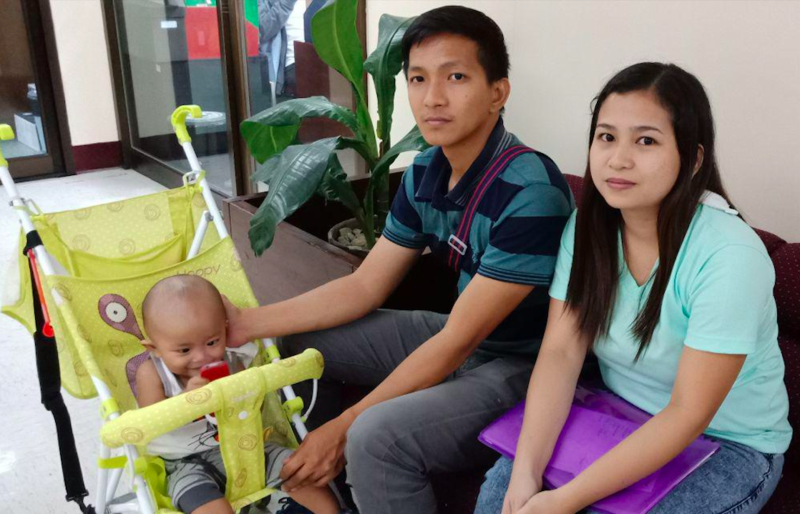 Now that Asher turned one-year-old, the couple took their chance and visited a medical and dental mission hosted by Philippine Charity Sweepstakes Office (PCSO) in Cabanatuan City recently. “Nagbakasakali lang kami na baka matulungan kami. Nag-try na kasi kami sa city hall dati kaso ni-refer din kami sa PCSO [We took a chance thinking maybe we could get help. We tried getting help from city hall but we were also referred to the PCSO],” Chillet said. That’s when they met PCSO General Manager Alexander Balutan who was busy supervising the medical and dental mission at the time. They approached the retired Marine general who didn’t fail to give them hope and Asher a bright future. Balutan assured them that the agency will maximize its financial assistance for his surgery up to his recovery. According to Jose Bernardo Gochoco, medical services department manager at the Lung Center of the Philippines, the agency usually gives P100,000 worth of financial assistance (maximum) to a patient with heart cases but that would still vary on the case rate and patient’s classification. At present, Asher has already been brought to the Philippine Heart Center in Quezon City with the assistance of PCSO to undergo various laboratory tests. They will have to wait for a week or two for the test results. “If all goes well, there is a round of case conferences to determine the best management. Then if he is up for surgery, there will be another round of pre-operative clearances to be scheduled before it is finally done. Afterwards, he will undergo post-operation recovery and rehabilitation if nothing goes wrong,” said Gochoco. Tetralogy of Fallot (TOF) is the most common cyanotic congenital heart disease (CHD). It is also known as “tet.” The “ tetra” in the name of the condition comes from the four problems associated with it and the condition is named after medical doctor Etienne Fallot. “The cardinal features associated with TOF are a hole between the right and left ventricles which is called Ventricular Septal Defect [VSD], narrowing of the pulmonary valve, which is called Pulmonary Stenosis [PS], aorta that has a shifted orientation and lays over the VSD [aortic dextroposition]and a thickening of the muscle of the right ventricle or right ventricular hypertrophy,” explained Maria Ronella Francisco-Mallari, pediatric cardiologist and active medical staff at the Makati Medical Center, Department of Pediatrics, Section of Cardiology. The symptoms of TOF may be present at birth or shortly afterward. They include cyanosis (bluish discoloration of the skin caused by blood low in oxygen), shortness of breath, and rapid breathing especially during feeding or exercise, clubbing of fingers and toes (an abnormal, rounded shape of the nail bed), episodes of passing out or loss of consciousness, poor weight gain, and developmental delays or problems. The tests that can aid in the diagnosis of TOF are echocardiogram, electrocardiogram, chest X- ray, pulse oximetry, and cardiac catheterization. “A child with TOF might have sudden episodes of deep cyanosis called ‘hypercyanotic spells’ or ‘Tet spells’ that may occur during crying, feeding, defecating, awakening from naps, fevers, dehydration,” described Mallari. According to Mallari, a CHD is a heart problem caused by abnormal formation of the heart during fetal development. In most cases, there is no identifiable cause for the heart defect. As to the case of Asher, “The condition can be genetic [hereditary]. Although multi factorial inheritance has been postulated for the majority of cases, single gene transmission is suggested by the observation of disease recurrence within families, as in the case of Asher and his grandfather,” said Mallari. Other than hereditary, studies have also shown that maternal abuse of alcohol during pregnancy, leading to fetal alcohol syndrome, is linked to TOF. In addition, mothers who take medications to control seizures and mothers with phenylketonuria are also likely to have a baby with TOF. “Poor maternal nutrition, viral illness or genetic disorder might increase the risk of this condition, in most cases the cause of Tetralogy of Fallot is unknown. In the case at hand, a good maternal history should be done to elicit other contributory information,” added Mallari. For treatments, Mallari suggested management of “hypercyanotic spells” or surgical repair. Management of “hypercyanotic spells” include knee-chest position, which increases preload and increases systemic vascular resistance. It also includes calming of the child (ideally having the child in family member’s lap), and oxygen supply (try to determine patients baseline saturating). Oxygen will decrease the pulmonary vascular resistance thereby increase blood flow to the lungs. Morphine can also be used to calm and decrease tachypnea, sodium bicarbonate to correct any metabolic acidosis, if present, and propranolol, which is thought to decrease infundibular obstruction and decreases tachycardia leading to greater diastolic filling. Complete intracardiac repair is an open-heart surgery, which involves several repairs: a patch is placed over the ventricular septal defect to close the hole between the right and left ventricles, the narrowed pulmonary valve is replaced or repaired, and the passageway between the right ventricle and the pulmonary arteries are widened to increase blood flow to the lungs,” explained Mallari. Meanwhile, temporary surgery may be done if the baby was born prematurely or has pulmonary arteries that are underdeveloped or hypoplastic. This is a palliative procedure where the surgeon creates a bypass (shunt) by placing a small tube between a large artery that branches off from the aorta and the pulmonary artery to improve blood flow to the lungs. “When the baby is ready for intracardiac repair, the surgeon removes the shunt during the intracardiac repair,” said Mallari. If left unmanaged or untreated, TOF can lead to complications such delayed growth and development, irregular heart rhythms, seizures, stroke, brain abscess, pulmonary embolism, sudden cardiac death, and bacterial endocarditis.